With the explosion of the CBD industry recently, there are now more options than ever before to buy CBD products online. Just as with any item, you want to make sure that you’re buying a quality product, but if you don’t have much experience in the CBD world, it can be confusing. Here are a few tips and things to look for when shopping for CBD products online, so you get exactly what you want. The strength of a CBD product is determined by the milligrams of CBD in the entire bottle, vape pod, or toothpick, as well as the amount in the individual serving. If you’ve never tried CBD before, it can be confusing to determine what is the right dosage for you. Look online and read about the various dosages to determine which is best for your needs and experience level, and then check the product description. You don’t want to puff more than you intended or get a lower dose than you expected, so pay attention to the CBD strength to ensure you get a CBD product that’s right for you. Just like when you’re shopping at the grocery store, you should always look to see what’s in the products you’re purchasing. Especially when it comes to CBD products, you should know what you’re inhaling or ingesting. Many companies online will get away with selling an inferior CBD product by stuffing in fillers or chemicals, but when it comes to CBD, you should accept nothing but the best. Check the product page and make sure that it is made with all-natural, hemp-derived CBD oil and that the other ingredients are kept to a minimum. It’s typical that in products like drops, there will be fractionated coconut oil, essential oils, or natural sweeteners to help with the taste, but there shouldn’t be much else. While in some cases the products can speak for themselves, you want to ensure that you’re buying from a company that has a rock-solid reputation. Learn more about the company that you’re purchasing from by reading their “about” page and learning more about their story. To earn your business, the brand should commit to providing quality products and going above and beyond to have their CBD tested by a third-party to ensure its purity. If the website looks sketchy, look elsewhere—there are tons of reputable suppliers out there. As the social animals we are, we tend to trust the opinions of people (even strangers on the internet) for everything from the best car wash to best disposable vape pen. So, read reviews for the products and see what people are saying before you make the purchase. Seek out answers to questions like: What experience did they have with the product? Did they notice any side effects? What about shipping speeds? These, along with other factors, are important things to look into when you’re considering a CBD product. As a final point, it’s worth mentioning that although CBD is federally legal and generally regarded as a safe alternative to other drugs or medications—and has provided numerous positive benefits to people around the world for centuries—some states still aren’t cool with it. Although it’s possible to buy CBD products online and have them shipped nearly anywhere, check with local laws to ensure you’re comfortable purchasing and using CBD. Most sites will also have disclaimers when they’re unable to ship CBD products internationally or to certain states such as Idaho, Nebraska, Ohio, or South Dakota. Buying your first CBD products or switching to a new provider can be a research-intensive process, but it’s a necessary one. Do your homework and make sure you’re spending your money on a quality product. The good news:Once you’ve found a reputable brand or product, restocking is super-easy the second time around. 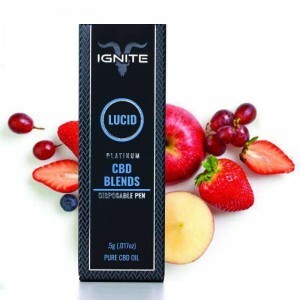 In an increasingly crowded marketplace, Ignite is the brand that people turn to time and time again as their trusted supplier of CBD products. Founded by entrepreneur Dan Bilzerian, Ignite is on a mission to change the way the world views CBD and other derivatives through superior products featuring high-quality ingredients from trusted sources. Each member of the Ignite team is dedicated to its mission of being a step above the rest. The company partners with the most experienced growers, cultivators, and manufacturers for a product that is safe, reliable, and second to none.